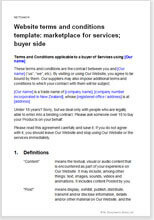 This terms and conditions template is for a website that connects buyers and sellers of any services. It sets out the relationship between your business and buyers who use your website to buy. These are T&C for a website that acts as an interface between buyers and providers of a service. They regulate the relationship between your business and service providers who use your website to sell. You could operate openly as a market or you could ostensibly be a review site where you promote particular services. You could charge the provider (as provided for in this document) or you could provide your market place service free and take advertising revenue. It is not important what services you offer. You could be an intermediary for a wide variety of services provided by individuals or companies, or you could specialise in a single sector, like accounting or care homes, or gardening. If you supply businesses, your site could create a marketplace for machine tool services or tractor re-conditioning or website design. Because each marketplace website has its own business model, we provide separate agreements for terms with buyers and sellers. You should therefore pair this document with the most suitable seller side marketplace T&C document we offer. We list the most appropriate documents below. connects buyers with sellers. Your business should not also be a seller, nor should it hold stock or fulfil orders on behalf of sellers. could have additional functionality that allows buyers to interact with sellers or with other site visitors, for example, product reviews, feedback, forums, or questions. provides payment facilities, collects taxes and your own fees, then pays the net amount to your sellers. has sellers that pay you either by a percentage commission or by a transaction fee. either allows sellers to upload their own product pages or product advertisements or instructs you to do that for them. provides a marketing service to sellers. are hosted in New Zealand although sellers and buyers could be located anywhere in the world. protect your business from complaints about content that your buyers posted - particularly important if buyers can interact with sellers without you actively monitoring every post or message. The law in these T&C is largely common law that deals with the basics of contracts: offer, acceptance, price and payment, provision of service, liabilities and risk. By and large, you can set the commercial terms you want. The document should be edited so that it reflects exactly how your business works. Our guidance notes will tell you what you can change safely, and what we don't advise changing.